Now that summer is here and you keep trying to come up with ideas on how to keep the kids busy, we have a simple craft idea that may help. 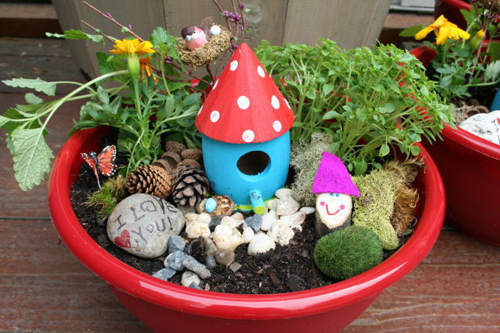 Creating a fairy garden in a flower pot or garden planter. It can be as simple or a complex as you desire and probably should be based on the kids age and your budget. 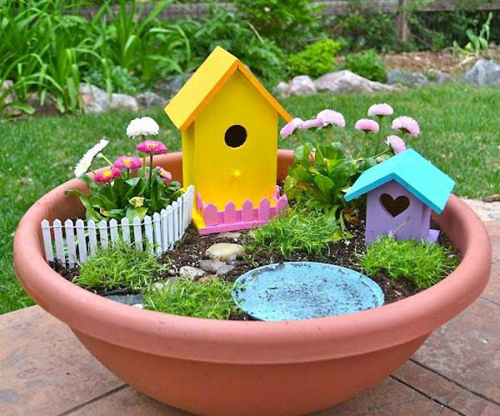 A potted fairy garden is such a playful and magical idea for any outdoor space or indoor area. They are imaginative and creative and can be complex and simple as you desire. 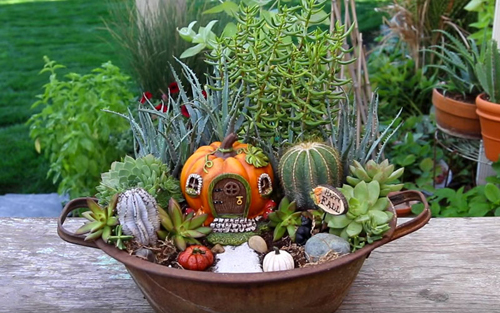 The idea of a fairy garden in a pot is that you add little plants, flowers, & items like picket fences, houses, signs, rocks and pretty much anything you desire, to create a magical place where your home and garden fairies can come and bring good luck and blessing to your home. Beachscapes, tea parties, water fairy gardens and so many other ideas you can incorporate to create a theme with. The first step is to come up with your theme. Then assemble the pieces you wish to incorporate into the potted fairy garden. Always have more than you think you will need. You want the garden to be filled not sparse and having left over items is much easier than the opposite. Start by selecting container. Is this going to be on the ground or on a table as possible a centerpiece? 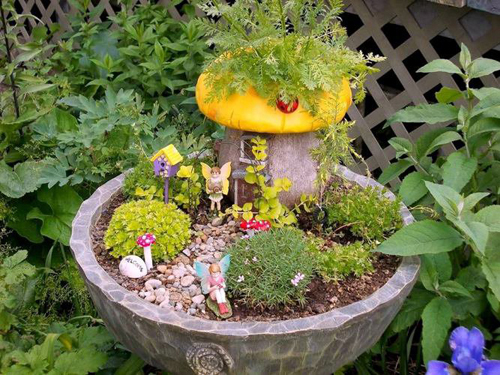 A low garden bowl makes a wonderful table top fairy garden. It is easy to move, doesn't take up much space and can be viewed over for dinner time conversations. A large garden planter sitting on the patio works where you can plant a pygmy palm at the back so it provides a umbrella awning for all the small fairy home and items. A large tray will work good. If you are using live plants versus silk or plastic you will need a container with holes for drainage. Next assemble your items. Pine cones, shells, marbles, glass rocks, mini rocks, mini terracotta flowerpots, tiny birdhouse, garden bench, wading pools or birds & rabbits. You can find unlimited items at most craft stores. Stay with your theme and build from there. Fill the container with potting soil. Next start with the large items and place them first. A church, home, birdhouse etc. Then start to build from there. Add live plants where they can grow freely and not cover your tiny items. Usually around the edges of the garden container works best. Get the kids involved in placing the smaller items. 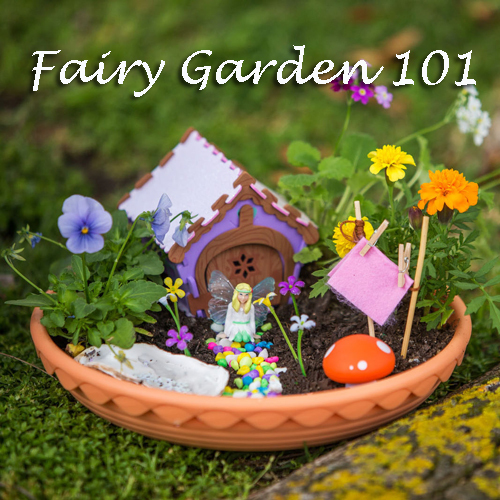 This is the time to add the fun stuff that will make your potted fairy garden magical. String of mini twinkle lights, picket fence. So we hope this give you some motivation and ideas for collecting your little ones and doing this fun potted fairy garden project. Share your photos with us and let us know how you did. Have Fun! fairy garden, potted fairy garden, fairy garden in pots, pots of fairy gardens.